Buying wine that has already been aged is of course highly convenient if you have the money to do so. Not very many people have the patience to sit on a bottle of wine for ten or more years until it has finally arrived at it's peak drinking conditions. But properly aged Bordeaux is hard to come across at your local wine shop. Most of the wines sell through before they can gain the type of age we're talking about. Even if you were to find an old bottle on a shelf the odds that it was stored in an environment that guarantees it's condition is very unlikely. The advice I would put forth would be to find an auction house or online retailer with a solid reputation of selling aged Bordeaux that has quality provenance. I have purchased dozens of bottles from Wine.com, WineLibrary.com, and JJ buckley which are all very reputable sources and have never once had an issue. 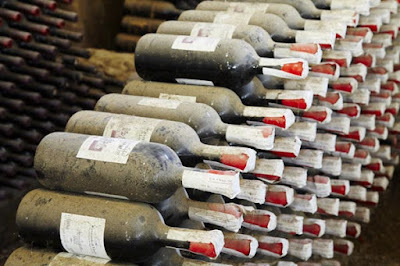 Of course another method is to trade with a collector who has a cellar full of older bottles that he or she is trying to drink or sell in order to freshen things up before certain wines begin to decline or become too old. In rare occasions (and this is a great scenario) you'll fine a small wine shop or liquor store that has a selection of older wine that no one has noticed tucked away from the public. A shop which once has a wine enthusiast buyer that purchased world class wines, but because of the stores location most of the business comes from selling booze and beer. In these rare occasions I have been able to find spectacular pricing on quality aged wines from around the world. I once purchased a bottle of 1990 Dom Perignon Rose for $100 this way and turned around and sold it on auction for $500!